Fall in New England is just the absolute best in my mind. My favorite season. My favorite weather. My favorite holidays. It is also that time of year you can hunker down at home and bring back the cozy comfort food that makes your house smell like a home while it is cooking. You know, the kind of food that makes your family feel like you put effort in to the meal. Smells that instantly make you leave your day behind you and focus on family time. At our house we have an abundance of cookbooks. We are a little bit obsessed really- but they are great references and they are well loved and used in our kitchen. Today I’m sharing our top five for fall. Some are new to our top five list and one will always be on the list. First up is a new one, The Ciderhouse Cookbook written by Jonathan Carr and Nicole Blum of Carr’s Ciderhouse in Western Massachusetts. This is on our list because we have loved Carr’s Hard Cider for years since we first discovered it at a small farmer’s market in Lenox, Massachusetts. This book is quintessential fall. With recipes like Roasted Carrots with Hard Cider Syrup, French Lentils with Cider Vinaigrette, Hard Cider Glazed Pork Chops and Cidersnaps, this book does not include recipes lacking flavor. We love how easy the recipes are to follow, the photographs, and of course the fact that Carr’s Ciderhouse is located in Western Mass, my home turf. We got our copy at our favorite independent bookstore here in Westerly, but they are also available directly through Carr’s Ciderhouse. Next on our list is Apples, a tiny little book by Andrea Albin published by Short Stack. Have you seen Short Stack books? They are adorable! Little paper books bound by staples, they have gorgeous colors and focus entirely on one ingredient. There are no photographs. There are no glossy pages. There are beautiful short blurbs written about each recipe and a really creative flavor combinations. In Apples we were delighted with the Apple & Fennel Salad with Buttermilk Dressing, Apple-Bacon-Brie Tartines, Gingered Apple Butter and the BBQ Chicken with Asian Applesauce. We carry Short Stack Books at Charlotte Julienne, but you can also buy them directly on line from Shortstack. Always on our list will be Eat Feed Autumn Winter by Anne Bramley. I personally love how the book is divided into Autumn and Winter and includes nearly 50 pages on how to stock a cold weather pantry. For all my organizing, list loving friends out there this part is fantastic! The pantry includes more than just food- think music, candles, pans and more. As far as the recipes are concerned they are super comfort/ cozy starting with Indian Spiced Cauliflower and ending with Maple Custards with Whisky Cream. This book is beautifully written & presented. There are quotes, toasts, tidbits of interesting information about holidays and menus. I could live in a cold weather climate forever if I had a huge pantry and this book by my side. New to us is The British Table by Colman Andrews. We love the concept of looking at the traditional cooking of England, Scotland and Wales. Separated by courses, this book has gorgeous photographs and bits of history that are great to have on hand for dinner parties. Because Andrews is looking at traditional cooking, we found the recipes to be just the type you want in the colder months. Practical and filling. From Breakfast Mushrooms to Kedgeree we are fond of the Bacon Roll for breakfast because well…bacon. And butter. And again, bacon. Other examples of recipes we love are Pork Chops with Cinnamon and Apples, Welsh Rarebit, Smoked Haddock Mash, Cheese and Onion Pie and Sticky Toffee Pudding. Our final pick for fall is Bountiful by Todd Porter and Diane Cu. If you don’t know, they are also the authors of the White on Rice Couple blog. I love White on Rice and was super excited to get this book. Printed in 2013, it is not a book that you will get sick of due to the incredible amount of variety within it. The recipes are inspired from garden foods including vegetables, herbs and fruits. Filled with numerous options for side dishes and desserts, the recipes are easy to follow and generally don’t use many ingredients. Some of our favorites are Creamed Swiss chard in Goat Cheese on Baked Potatoes, Bourbon Sours with Orange Bitters, Roasted Broccoli and Grilled Cheese Melt, Kale and Chicken Egg Rolls with Ginger Soy Dip, Hearty Celery Root and Red Lentil Soup and Butterscotch-Apple Mini Gallettes. Truth be told there are over one hundred recipes here and they could all easily be on my list of favs! 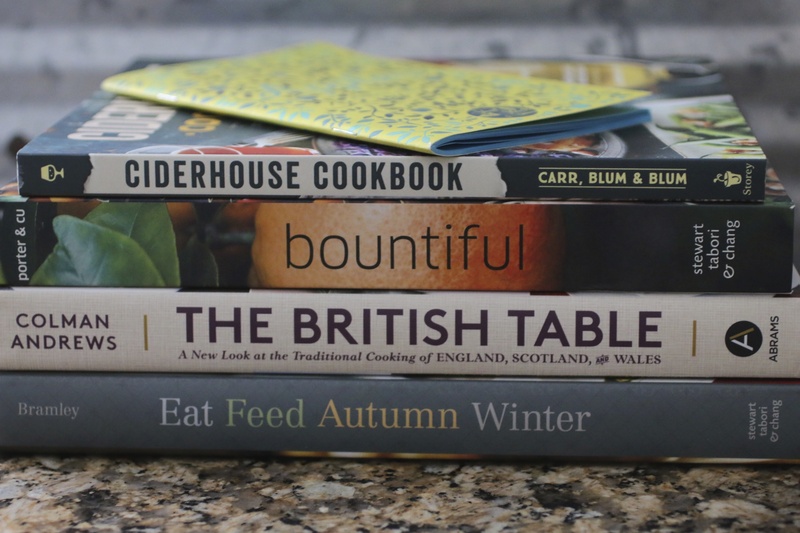 We’d love to know what your go-to fall cookbooks are. There is always room for one more on our shelf.